The executive director of Residential Life and Housing Services has overall responsibility for the undergraduate residence halls, graduate/family housing, and off-campus housing. Together with the other staff and advisory groups, the executive director creates policies and makes final decisions that affect both students and facilities. The executive director is also responsible for billings and statistical information pertaining to residence halls, as well as the same functions for the graduate and family housing system. The director for the undergraduate residential life has overall responsibility for undergraduate housing areas, departmental training programs, and other senior leadership functions. The director of housing operations has overall responsibility for facilities operations and room assignment processes - including freshman, upperclassmen, and graduate room placement and room changes. The coordinator for off-campus housing and administrative operations is responsible for the University’s commuter support programs. This includes providing off-campus housing listing services (for undergraduates, graduate students, medical center, faculty, and staff); developing on- and off-campus support services, resources, and programs; individual advising and counseling; liaison with the campus community, landlords, and neighborhood associations; and advocacy for University commuter needs. The assistant director for graduate and family housing is responsible for the University’s graduate student housing areas Goler House, University Park Apartments, and Whipple Park Apartments. This includes developing support services, resources, and programs; individual advising and counseling; liaison with the graduate community; and advocacy for the University’s graduate student needs. The associate director for freshmen housing programs and fraternity quad is responsible for our freshmen experience encompassing the first year living areas in the Residence Quad, Genesee and Susan B. Anthony Halls. This includes the oversight of the Freshmen Fellow and D’Lion programs. Additionally is responsible for all nine houses on the historic Fraternity Quad and Burton and Crosby. The associate director for river campus upperclassmen housing and undergraduate apartments is responsible for our upperclassmen areas of Jackson Court (Anderson, Wilder, and O’Brien) and Hill Court. This includes several special interest housing. Additionally is responsible for Southside, Riverview, and Brooks apartments. Resident directors assist the assistant directors for their living area. Their duties include coordinating check-in and check-out; supervising graduate head residents (GHRs), resident advisor staff, and service desk employees; maintaining records; advising student groups; and meeting with students to discuss problems. They live in the housing area and provide on-site professional services outside normal business hours. There are graduate head residents (GHRs) in many of the buildings to assist students and the RA/CA staffs. Your graduate staff member may be responsible for area-wide programming, service desk supervision, resident advisor supervision, hall governments, discipline, etc. There are graduate house advisors (GHAs) in our fraternity and affinity houses located on the Fraternity Quad. These graduate staff members are responsible for area-wide programming, discipline, and community leadership. Community assistants (CAs) are similar to RAs but support a larger number of primarily upperclass students in apartments and suite-style housing. The CAs are responsible for building upperclass student communities and providing peer support. They are more involved in the administrative operations of their living area. 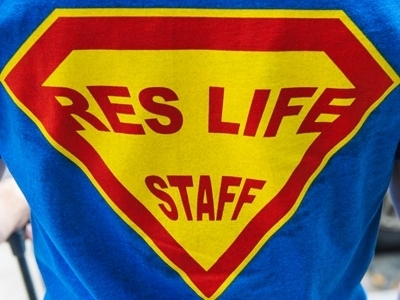 Resident advisors (RAs) are upperclass students living on your floor who are trained in various skills, including community building, counseling, advising, programming, resource referrals, and emergency services. The selection of RAs is based on their maturity, common sense, programming ideas, and peer counseling skills. They are on your floor to act as resource persons, to assist in establishing a sense of community, and to interpret University policy and assist in its enforcement.